Ada's Classic Four Prong Solitaire man made diamond engagement ring is a traditional four prong setting, custom made to order. Available options: platinum, 14k or 18k gold: white, yellow, rose. Make your dream ring come to life with our 21st century custom design process and conflict-free diamonds. Shown with a round brilliant center stone. Ada Diamonds Design Description- Affectionately known as "ring pop" by our Diamond Concierge team, this timeless and traditional solitaire setting features four prongs for maximum security. Customize your Classic Four Prong Solitaire with band widths from 1.8-3.5mm, in a rounded comfort fit or knife edge style. Additional Description- All of Ada's solitaire engagement ring settings are fully bespoke and made to order. 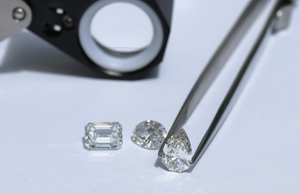 Our friendly Diamond Concierge are here to help you create the perfect ring customized to meet your needs with our conflict-free lab diamonds hand selected for quality, fire, and brilliance. Inquire to get started or learn more about our exclusive Concierge Experience. This setting qualifies for Ada's Proposal Setting program. Ensure your proposal is a complete surprise! Proposal Settings are solitaires set with your choice of center stone that are ready to ship in 1-2 weeks. Should you or your partner decide to upgrade, you may apply the cost of the solitaire setting towards a bespoke ring after the proposal and enjoy a complimentary re-setting. Learn more about Proposal Settings and our custom design process.